Governor DeSantis continues to surprise me. Keep up the good work. I love how he's taking on algae pollution, banned fracking, appointed a Chief Science Officer, and asked for resignation of every single industry hack on the South Florida Water Management District. Every single one. 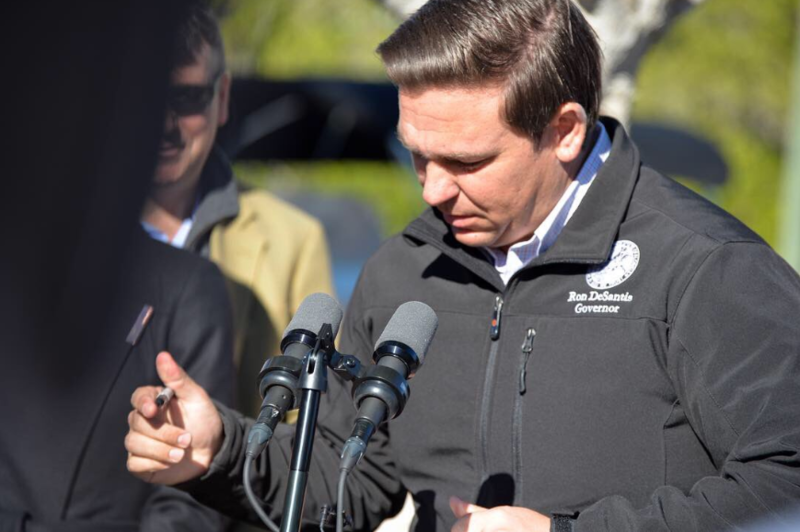 Governor Ron DeSantis spent the day touring the state announcing big changes to the way his office will handle water issues. He started by signing an executive order to dramatically increase funding for the Everglades, algae research, and a ban on hydraulic fracking. He ended the day in Stuart, Florida announcing he had asked for the resignation of every board member at the South Florida Water Management District. The morning began with a quick boat tour of the Little Hickory Bay behind Bonita Beach, where Governor Ron DeSantis stood, flanked by conservation leaders, a fishing boat captain, and state legislators. After docking, he signed an executive order to spend 2.5 billion dollars on work and research to solve water flow problems, algae blooms, and other environmental concerns. “That represents one billion dollars more than the previous four years,” DeSantis said. His order also calls for the appointment of a “Chief Science Officer” and moving enforcement of environmental law under the jurisdiction of the Department of Environmental Protection- as opposed to the Fish and Wildlife Conservation Commission; which oversees enforcement now. Two moves that stood out to Conservancy of Southwest Florida President Rob Moher. “I think the enforcement and the focus on science have been critical missing pieces and that’s a big missing piece that we have not had on the table that is now on the table,” Moher said. The executive order also establishes a “Blue-Green Algae Task Force,” creates an “Office of Environmental Accountability and Transparency,” and urges the South Florida Water Management District to immediately push forward with the Everglades Agricultural Area Reservoir. DeSantis signing executive order 19-12. The Governor also expressed frustration with the Army Corps of Engineers, and his executive order includes language holding that agency to account. “We want them to understand the effects that the blue-green algae has had on the coastal communities and to do everything in their power – which I don’t think they’ve done so far- to mitigate that,” DeSantis said. 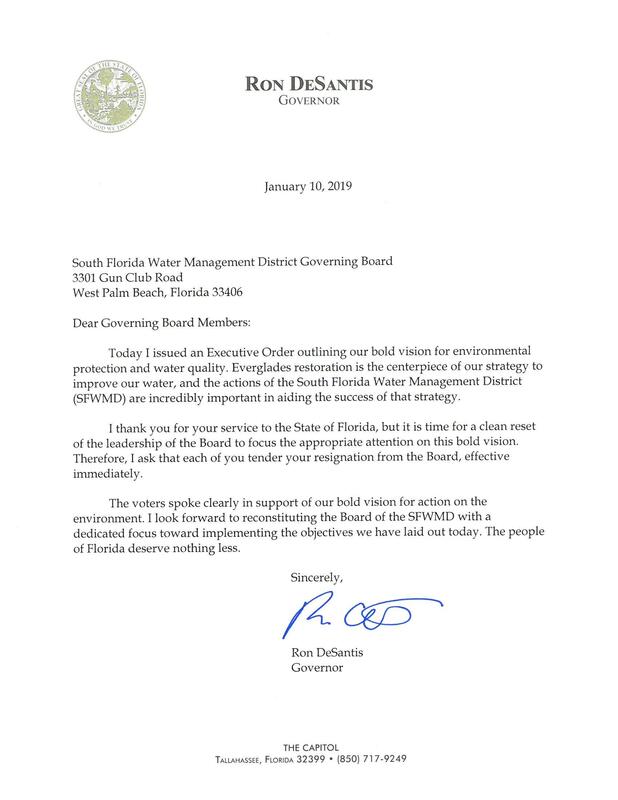 Later in the day at a stop in Stuart, DeSantis announced he’d sent a letter to every member of the South Florida Water Management District board thanking them for their service, and asking for their resignation – effective immediately. This is the same board that, just before the election late last year, approved to lease 16,000 acres – which was to be used in the EAA Reservoir Project – for farming by New Hope Sugar Company through 2027. Tallahassee, Fla. – Today, Governor Ron DeSantis signed Executive Order 19-12 (Achieving More Now For Florida’s Environment), implementing major reforms to ensure the protection of Florida's environment and water quality. 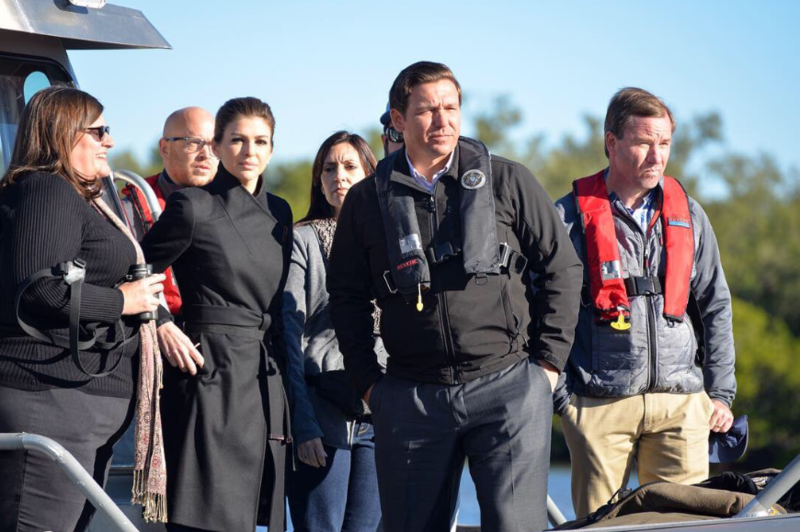 "Our water and natural resources are the foundation of our economy and our way of life in Florida," said Governor Ron DeSantis. "The protection of water resources is one of the most pressing issues facing our state. That’s why today I'm taking immediate action to combat the threats which have devastated our local economies and threatened the health of our communities." - $2.5 Billion over the next four years for Everglades restoration and protection of water resources (a $1 Billion increase in spending over the previous four years and the highest level of funding for restoration in Florida’s history). - The Establishment of a Blue-Green Algae Task Force, charged with focusing on expediting progress toward reducing the adverse impacts of blue-green algae blooms now and over the next five years. - Instruction to the South Florida Water Management District to immediately start the next phase of the Everglades Agricultural Area Storage Reservoir Project design and ensure the U.S. Army Corps of Engineers approves the project according to schedule. - The Creation of the Office of Environmental Accountability and Transparency charged with organizing and directing integrated scientific research and analysis to ensure that all agency actions are aligned with key environmental priorities. - The Appointment of a Chief Science Officer to coordinate and prioritize scientific data, research, monitoring and analysis needs to ensure alignment with current and emerging environmental concerns most pressing to Floridians.